When I first got done reading the last page of this book, all I could say was...WOW! Ginger Garrett did an amazing job of bringing the characters of 2 Chronicles 21-23 and 2 Kings 10-11 to life. She takes us back to the days of evil kings, faithful servants, amazing prophets, and false gods.The story is told mainly through the eyes of princess Jehosebeth, wife of the high priest Jehoiada. When God's judgment comes upon the house of Ahab (King of Israel)and King Ahaziah (of Judah) is killed, his evil mother Athaliah decides to destroy the royal line of David. Athaliah is the daughter of Jezebel, who's reputation stands alone in Scripture. Athaliah wants to rule and follow in her mother's footsteps. Jehosebeth, in an amazing true story of faith and courage takes her nephew, Joash, and hides him until he is of age. Preserving the lineage of David and God's Promise. I was almost in tears at the end of this book because I just love the "return of the king" stories.I feel in love with the way the author describes the evil spirits and the acts of God. She really puts the spiritual battle that's going on behind the curtain in the heart of the story. Which I believe is vital.I look forward to reading more books from the author. "The Lord declares to you that the Lord himself will establish a house for you...Your house and your kingdom will endure forever before me; your throne will be established forever" (2 Samuel 7:11,16). "And I will put enmity between you and the woman, between your offspring and hers" (Genesis 3:15). Years before, God promised David that his descendants "shall never fail to have a man on the throne of Israel" (1 Kings 9:5). But in Israel that promise is a distant memory, dimmed with the passage of time, and the royal house has been infiltrated by idolaters with dreams power and a burning desire to see the Jewish faith permanently discarded in favor of gods such as Baal. The kingdom has become divided. In Israel, Ahab rules with the scheming Jezebel at his side. One of their daughters, Athaliah, is sent to Judah to marry Jehosophat's heir, the prince Jehoram. And Athaliah is every inch her mother's daughter, bringing to her marriage new gods and a burning desire to control the throne and rival her mother's power in the north. 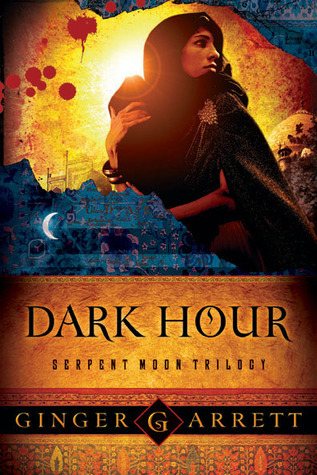 In Dark Hour, the first novel in the Serpent Moon Trilogy, Ginger Garrett brings this small slice of Old Testament history to vivid, colorful life. Garrett's scriptural source material is 2 Chronicles 21-23, the story of Jehoram and his son Ahaziah, and how both were manipulated by Athaliah's machinations and perverse religious influence. She was nearly successful in her carefully planned attempt to usurp the throne and destroy the line of David. Athaliah, daughter of the infamous Jezebel, absorbed all of her mother's ways, and sought at every turn to undermine the Jewish faith and consolidate power to herself and her gods of wood and stone. Her nemesis is Jehoshebeth, the daughter of Athaliah's strongest rival among Jehoram's wives. Jehoshebeth's mother dies giving birth to her, and in her death throes prophesied that her child would be Athaliah's doom. Athaliah, confident in herself and the power of her gods, raised the girl to be ignorant of her true parentage and grew complacent, forgetting her dead rival's words until her pride and ambition led to her downfall. Athaliah ruled on her own for six years following a murder spree she ordered to eliminate her rivals to the throne. One woman dared to stand against Athaliah's murderous schemes and saved the life of Joash, an heir of David, who was eventually crowned and in so doing restored the Davidic dynasty to the throne. Out of these brief scripture references, Garrett has crafted a stunning novel that illuminates this criticual juncture in biblical history. As Garrett states in her Author's Note, "[t:]heoretically, other heirs of the house of David might have been alive to continue the bloodline. But God used Joash. It's startling to think that the future of Christianity, of the person of Jesus Christ, was held in the hands of one terrified woman defying an evil queen." Based on the 2 Chronicles account, little is known of Jehoshebeth. The Bible hints at the incredible bravery and devotion to God that it must have taken to risk all in incredibly dark and dangerous times. In Dark Hour Garrett carefully crafts a very real, flawed heroine who struggles with faith, courage, and destiny, and whose bravery stands as a shining example of God's faithfulness to His promises. Dark Hour is biblical fiction at its best -- an absorbing, meticulously researched, well-written account of a dark chapter in biblical history. Garrett is a master storyteller and succeeds in a stunning fashion, fleshing out the scriptures and bringing ancient Israel and her people to vivid life. Dark Hour more than succeeded in holding my interest -- itinspired me to delve deeper into the scriptures for further study of the fascinating history illuminated in the novel. In her Author's Note Garrett states: "For those of you, like me, who once believed the lie that the Bible is a tale of repressed women mastered by men and submitting through force, coming to the tale of Athaliah and Jehoshebeth is a shock. Athaliah did what no woman had ever done, ruling as sole monarch in Judah. Jehoshebeth was a formidable enemy and ultimately proved her undoing. I read the Bible now and am impressed with the role of women in the story..." Well said. I very much look forward to more from Ms. Garrett. Read this novel and be fascinated and encouraged by this incredible story of God's promises and His faithfulness shown through the life of a woman willing to stand for truth. Book #2, Midnight Throne (the story of Ahab, Jezebel, and Elijah), is due out in June 2007, and book #3, Huntress Night (the story of Samson and Delilah) is due out in spring 2008. UPDATE March '07: Info from the author's blog -- the remaining books in the Serpent Moon Trilogy have been cancelled (only temporarily, this fan hopes!). Okay, I opened this book and I didn't want to put it down. While it kept me reading, it was very dark and there wasn't much to redeem the story. After all, it followed one of the bad girls of the Bible who met a tragic end.If you are looking for books on the darker side of fiction by Christian authors, Garrett is a good author to choose. I personally came away feeling sad and a little disturbed. I would rather read a book my Tracy Higly, who deals with some of the same issues yet redeems them in a powerful way. I was looking foreword to reading this book because I had loved Ginger Garrett's other book Chosen: The Lost Diaries of Queen Esther so much, and I'm happy to say that I was not disappointed. She as always does a beautiful job of taking scriptural truth and making it in to an amazing and powerful story. I recommend this book to anyone and everyone who loves history or just loves reading new books. One of her best yet! I read this a few years ago and I had forgotten the title of the book and the name of the author, but I was so into this story that I hunted down the title and author's name YEARS later in order to be sure and read other works by her. This book completely overwhelmed my senses. I don't want to give too much away but it totally opened my eyes to what it would have been like to live in the period of the real jezebel. I won't let this author slip away again. I'm subscribed to her now. Highly recommend this book. Even though it's fiction, it's true to biblical period and stories. You will feel like you are literally right there with the characters. This is a surprisingly good book, and as my first biblical fiction book it left a good impression. Because of Dark Hour I'll be exploring that genre later on. The book focuses on the lives of a royal family and the doings of an evil woman hellbent on becoming queen, and not caring whom she harms. The characters are well crafted, their personalities are very different, and consistent. I can see them as real people (and they are based on real people, but that makes the character building territory all the more treacherous! ).The story is well crafted, the plot is thick, but it is a bit wordy. I think many paragraphs could have been cut out and I wouldn't have lost anything pertinent to the storyline or character development. What really sold me on the book, believe it or not, is the explanatory bit at the back where the author explains where her inspiration came from. She wrote this thick, well-written story based off of brief tidbits of scripture. The sheer magnitude of research the author must have faced and the amount of effort she must have put into this book impressed me all the more. I definitely recommend the book, and the author. This book was amazing. Never before have I seen a female author tackle darkness to this extent and it gives me hope and encouragement that Christian fiction isn't all cookie cutter perfection.Ginger weaves a wonderfully engaging tale that had me enthralled from start to finish. My husband found me on several occasions with my nose in this book between tasks over this busy weekend. Even a little carsickness couldn't keep me from finishing this book. She wasn't bashful about writing of the immense darkness of the time. I felt the despair and my heart clenched during defeat, but I was also enveloped into the quiet love and the triumph of the victory. With twists and turns, I was on the edge of my seat the WHOLE time.Not for the faint of heart, but definitely worth reading. I highly recommend. This book, based on the events recounted in 2 Chronicles 21-23 and 2 Kings 10-11, tells the story of the daughter of Ahab and Jezebel, Athaliah, her attempted takeover of the kingdom of Judah, and the secret preservation of one of David's heirs, the boy king, Joash. Told from the point of view of Jehoshebeth, daughter of King Jehoram and wife of the high priest, who defied her stepmother and hid baby Joash. Ginger Garrett really brings this incredible story to life! Beautiful writing, well-developed characters, and of course an unbelievable story! The historical detail is very well done, and the author's note adds even more fascinating information. Very well done! There's very little written about Jezebel, Athaliah, and the "Dark Ages" of Isreal/Judah history especially when it comes to Biblical fiction. This is a great book! Based on the account from II Kings 11 and II Chronicles 21-23 pivoting back and forth between the POV of Athaliah and Jehoshebeth its a beautifully written novel. It encouraged me to do some extra research into the lives of these two women..... one so incredibly evil and the other willing to risk her life to save the next generation of the House of David!! Worth the read!! Although fictional, this book is based upon biblical, historical events from the bible of 2 Chronicles 21-23. To say that it brings these events to life is really an understatement. I read this book with the bible close by and was surprised at how closely the story followed biblical events. The writing was fresh and exciting and I never knew how characters would be woven together or what actions would be taken to affect the storyline. I enjoyed reading this book tremendously. I loved this book from page one and had a hard time putting it down once I started reading. It's fast paced, engaging and consuming. My only disappointment is that the other books in the series were never published. Though this book works just fine on its own I would have loved to have read what came next. Garrett makes the superstitions, false gods, terror, and scheming come to life in her interpretation of 2 Chronicals 21-23 and 2 Kings 10-11.A deliciously dark rendition of the book and then going back and reading the scripture was interesting.It's too bad the second and third installments will not be forthcoming. I really loved how real the story was and how there seemed to be, for lack of a better way to pu it, a method to Athaliah's madness! It really made that little known story in the Bible come alive to me and moreso because the Presence of God was real but not 'spooky' or 'weird' but so...relatable.Once again, Ginger Garrett did not disappoint! This was a page turner, a pretty gruesome one, but I am sure the time period and circumstances warranted it. I now want to read this story in the Bible to see how much of this really happened, and that's a good thing! Hm, well, kinda dark and at times gruesome. It's a loosely Biblical fiction story. Amazed me how some kings followed God and others got swayed by all the various gods/goddesses.... kinda like today - amazing how many idols we allow in our lives to take our focus off of God. I'm a sucker for historical fiction and this book took an Old Testament Bible story and added some color and depth to it. Although I'm not an expert on Middle Eastern culture and customs, this book made the story of Jehoshabeth and Joash come to life and feel authentic. Interesting plot with interesting characters. Do to the violence of the actual events I believe she avoided describing them rather well. Though she did go into to much detail every now and then. I really enjoyed this book. This is set in the time of the house of David (2 Chronicles 21-23). The historical detail is vivid. This really brought the story to life in a very real way. This book really brought this Old Testament story to life for me. Loved it! Never a dull moment and best of all based on the Bible! Ginger Garrett - Ginger Garrett is the author of the Chronicles of the Scribes series (In the Shadow of Lions, In the Arms of Immortals, In the Eyes of Eternity), Wolves Among Us, Chosen, Desired, Dark Hour, and Beauty Secrets of the Bible. Chosen: The Lost Diaries of Queen Esther was recognized as one of the top five novels of 2006 by the ECPA.Focusing on ancient women's history, Ginger creates novels and nonfiction resources that explore the lives of historical women. A frequent media guest and television host, Ginger has been interviewed by Fox News, Billy Graham's The Hour of Decision, The Harvest Show, 104.7 The Fish Atlanta, and many other outlets.A graduate of Southern Methodist University with a degree in Theater, she is passionate about creating art from history. Ginger resides in Georgia with her husband and three children.